Chennai Super Kings (CSK) completed a hat-trick of wins in the Indian Premier League 2019 (IPL 2019) as MS Dhoni’s boys defeated Rajasthan Royals by eight runs at the MA Chidambaram Stadium in Chennai. Chasing 176, Royals could manage only 167 inter allowed 20 overs as CSK prevailed in the close contest. The win was CSK third as they continue to stay unbeaten and top the IPL 2019 points table. For Royals, it was third consecutive defeat. 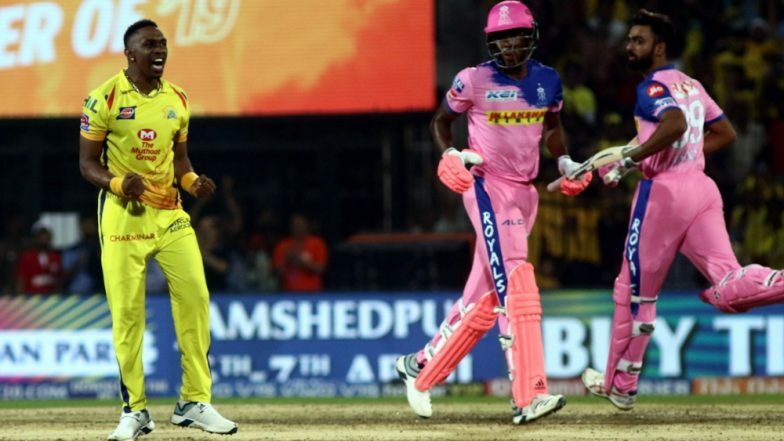 CSK vs RR Highlights IPL 2019: Chennai Super Kings Beat Rajasthan Royals by 8 Runs. Dwayne Bravo bowled a tight last over to deny Royals 12 runs from it. Bravo removed dangerous Ben Stokes on the first ball to turn the tide in favour of Super Kings, otherwise, Royals were looking well on course for their first win of the season. Stokes, who scored 46 off 26 balls, emerged as the top run-scorer for Royals. He kept his side in the contest till the end and formed valuable partnerships with Krishnappa Gowtham and Jofra Archer. For CSK, Deepak Chahar, Shardul Thakur, Imran Tahir, and Dwayne Bravo scalped two wickets each. IPL 2019 Points Table Updated: CSK Jumps to Number 1, RR Languish at Bottom of the Indian Premier League 12 Team Standings. # Imran Tahir now has the most wickets by an overseas leg-spinner in IPL. He surpasses Shane Warne. # 75 not out is MS Dhoni's second highest score in IPL. 79* vs KXIP in IPL 2018 is his highest. # This is CSK's fourth successive win at Chepauk in IPL. # This is CSK sixth consecutive win since May 20, 2018. # 28 is the third most expensive over in IPL. Dhoni & Jadeja scored off Jaydev Unadkat. Earlier, put to bat first, Super Kings after losing three early wickets managed to post 175 from 20 overs. It was Dhoni’s unbeaten 75 off just 46 balls that lifted the CSK to a competitive total. CSK at one stage were 27 for 3 and then Dhoni and Suresh Raina added 61 runs for the fourth wicket. MS Dhoni Hits Masterful 75 During CSK vs RR in IPL 2019 Match at Chennai, Registers 21st Fifty in Indian Premier League. Dhoni also added 56 runs for the fifth wicket Bravo to take Super Kings to a safe total. Bravo scored valuable 27 off just 16 balls. The last two overs of CSK innings fetched 52 runs, with the bulk of the contribution coming from Dhoni’s bat.